Symantec's newest version of its Norton Online Backup launches today, and with it comes a little help for cross-platform users, thanks to the addition of Mac support. Norton Online Backup 2.0 costs $49.99 for a one-year subscription, and includes 25GB of online storage (you can buy more for an additional fee), 90-day file versioning (it'll keep older versions of the files you've backed up for up to 90 days in case you need to retrieve an older file), and the ability to e-mail backed-up files to others straight from your backup. You can back up files from up to five PCs or Macs with Online Backup 2.0, making it a convenient way to shuffle files saved on one computer to your other computers. Although Norton Online Backup is a Web-based utility, it uses a lightweight client app that you install on any five Macs or PCs that you want to use with the service. This small app controls traffic, so to speak; it talks with the backup server to identify which files need to be backed up, and when to perform the backup. Aside from that, Norton Online Backup is pretty much set-it-and-forget-it simple to use. In my limited hands-on using the service on my MacBook I found Online Backup to be pretty seamless and out-of-the-way. The Online Backup client app runs in the background; the only sign of its existence is an icon in my menu bar. From the menu bar icon, you can go to the Norton Online Backup home page (which shows you all the computers associated with your account and their backup status), start a backup, and restore files. 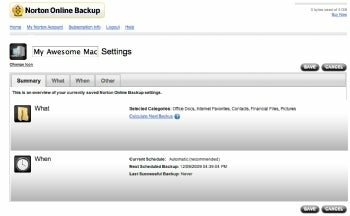 Norton Online Backup 2.0's settings screen. For all other tasks, such as starting backups, changing settings, restoring files, and so forth, you use the online interface. The Web interface is straightforward and easy to get around. Norton officially supports Internet Explorer, Firefox, and Safari. By default, Norton Online Backup will back up every day once it detects an Internet connection, though you can changes this as you see fit. Norton Online Backup does not automatically sync selected files and folders, though. Say, for example, I want to sync a folder containing a story I'm working on across my Mac notebook and my PC desktop, and have it sync automatically whenever I save a file, for example. Symantec chose not to take this route, however. If you're looking for something like this, though, you may want to consider a service like Dropbox. Also, I wasn't a big fan of where the Norton Online Backup client gets installed on OS X. Typically Mac apps get put into the Applications folder, a common repository meant to store all your installed software. Instead of installing into the Applications folder, however, the Norton Online Backup client (and its uninstaller) gets installed into the Library > Application Support folder on the root level of your Mac's hard drive, which is a folder that most average users will probably almost never touch. This choice of location may make it difficult for you to remove the Norton Online Backup client should you choose to do so, as you might have a hard time finding it (there are uninstall instructions in the included documentation, but that fact doesn't make up for the app's installation location). If you're on a Mac, be aware of this one caveat. Norton Online Backup supports Windows 7, Vista, and XP, as well as Mac OS X Snow Leopard (version 10.6). Symantec will offer a "Mac Edition" for sale at Apple Stores and other Mac retailers, but Symantec was quick to note that either edition will work on either a Mac or PC--the difference is in the packaging and marketing of the product. You can find more information on the Norton Online Backup site.